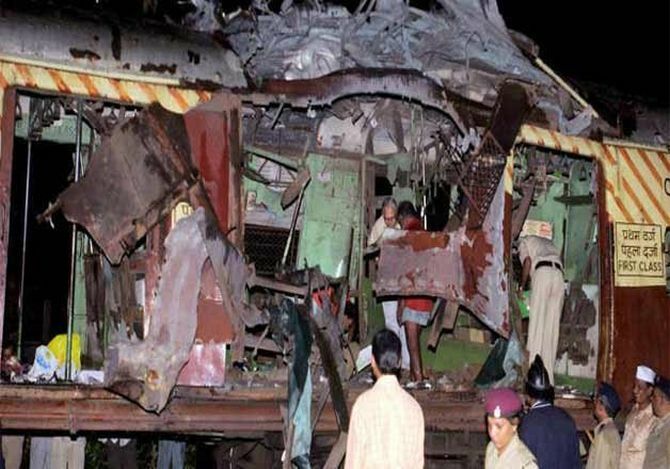 Families of the victims of the 2006 serial train blasts in Mumbai that killed 189 people hailed as a “correct punishment” the death penalty awarded to five of the 12 convicts and life sentence to the remaining, observing that justice has been delayed but not denied. For the family of Parag Sawant, who had become one of the enduring images of the carnage and who died recently after battling for life in a hospital for nine years, justice though will be served only after the convicts awarded capital punishment are hanged. The family members of the 189 people who lost their lives and the 829 injured in seven powerful blasts that ripped local suburban trains between Matunga and Mira Road on the Western line on July 11, 2006, while welcoming the decision of the special court said the trial should have been expedited. The trial was concluded by a special MCOCA court nine years after the blasts. “Justice will be done only after the convicts are hanged to death. We have lost our son. What happened to us should not happen to anyone else in future. A strong message has to be sent by our judicial system that such acts will not be dealt with lightly,” Parag’s father Jayprakash said. Parag died in July this year becoming the 189th victim. He is survived by his parents, wife, a minor daughter and a brother. Parag, then 27 and newly married, had bought a first-class train pass for the first time on July 1, 2006, after getting promoted as assistant manager at a private firm. Ten days later, the blast took place in the first-class compartment of a Virar-bound train near Borivali, severely injuring several commuters, including Parag. to meet a client in South Mumbai and fell victim to one of the blasts. His wife Yogita was left to fend for herself and her two school-going children. “The court has given a correct punishment. They (convicts) took so many lives in a matter of a few minutes, but it took nine years to prove them guilty,” she said. Her son and daughter are pursuing CA, while she takes up projects like selling garments and decorations during festivals like Navratri to support her family. Anita took up a job as a train indicator peon at Malad station that was offered to her by way of compensation by the railways. After Abhinav’s death, she moved out of her matrimonial house with her then three-year-old daughter and found solace in her job. She had recently got married. Dinesh Singh and his wife Meena, who lost their 22-year-old son Amit, have stopped discussing the tragedy. “It only brought back tears and anger. My son is dead and gone leaving us in pain. But my heart goes out to the those injured persons who are still struggling. Now with the court verdict families can get some closure,” he said. For Sweta Futane, a peon at Andheri station, life was equally hard. Not only did she lose her child, but in a span of 15 days, she lost her husband in the train blasts. She had been married for a year in 2006, when she lost her child and then on July 11, her husband Yogesh Futane died in the train blast between Mahim and Matunga. With no support from her in-laws, Sweta took up a job in the railway. Two years ago, she married Shrimat Khanore, a BEST employee. Mahendra Pitale, a sculptor, lost his left arm in one of the blast and thus his livelihood. “I got a prosthetic arm which suffices for most of my chores but I could not get back to sculpting. I am glad that the convicts have been given punishment,” he said. A regular commuter from Dadar to Borivali, Roysten D'mello, 38, was among the scores of injured people who had sustained grievous injuries. He lost sensation in the left hand and now lives with an iron rod inserted in it. D'mello said he has undergone three surgeries till date and his life, since 2006, has completely changed. On the verdict, he hoped that it will at least offer some relief to families who lost their loved ones. Ashwin Boricha, 38, who was travelling from Dadar to Borivali on that fateful day, was hit by the attack at Jogeshwari. He said he suffered almost 70 per cent hearing loss and has shrapnel embedded in his face and thigh. He said the verdict has come so late that it does not affect him any more. Ramesh Naik, who lost his daughter Nandini, said the blast didn’t just kill his daughter but killed relationships. He said they now just have photographs of his daughter. Naik has named his granddaughter (his son’s daughter) ‘Nandini’ in memory of his daughter. Siddharth Sawant, son of Suryakant Sawant, who survived the blast but suffered a serious head injury, said verdict has come after nine long years and that the trials in terrorist attack cases should be completed in a year’s time. Former ATS chief K P Raghuvanshi welcomed the court verdict, saying it had vindicated the efforts of his team of officers which conducted the probe even as the defence counsel said they will appeal in the high court. "I congratulate all my 15 officers, who had probed the case. The verdict is a vindication of our efforts. I am happy that the court has appreciated the evidence and given an appropriate quantum of punishment in the case," he told PTI. Soon after the quantum of sentence was pronounced, Raghuvanshi arrived at the city sessions court in Mumbai and said, "I am satisfied with the quantum announced by the court. I would have been more happy had all the convicted been awarded death sentence." "All the claims of people who had accused us of arresting the wrong people have been proved false. With this verdict, police's credibility has increased. The judgement proves that truth cannot be hidden," he told reporters. Leading lawyers too hailed the decision of the court. "I welcome the verdict because in this case the evidence was circumstantial and the prosecution was able to successfully prove the guilt of the accused," said Ujjwal Nikam, a leading public prosecutor who has appeared on behalf the state in many terror-related cases. Nikam said that the court had accepted that there was a criminal conspiracy to create the serial blasts during peak hours in local trains. However, in a criminal conspiracy all the conspirators have an equal role to play and they are also responsible individually and collectively for the terror act. Therefore, all the convicts should have got death punishment. However, advocate Sharif Shaikh, who defended some of the convicts in this case, said, "They have been falsely implicated by the ATS (prosecuting agency). We shall appeal in the Bombay high court. All those ATS officers who have fabricated evidence in this case will go behind bars." The case had seen a twist when the defence lawyer sought to call Indian Mujahideen co-founder Sadiq Sheikh as defence witness after he told the police in 2008 that IM members were responsible for all the blasts that happened since 2005 including the train blasts. The court had allowed examination of Sadiq as a defence witness but he later claimed that he gave his confession under duress. Leading defence lawyer Majeed Memon said the verdict was expected to be "harsh" because a serious offence had been committed against the society. However, the death penalty imposed on five convicts would assume finality only after the Bombay high court confirms the punishment awarded to convicts. The Maharashtra government welcomed the court verdict in the 7/11 serial train blasts case, saying that it was committed to strengthen the justice delivery system in the state. Expressing satisfaction on the judgement, Finance Minister Sudhir Mungantiwar said in the last one year the conviction rate has gone up from 9 percent to 35 per cent. "In the last one year, Chief Minister Devendra Fadnavis has worked on improving loopholes in the judicial delivery system," he said. NCP spokesman Nawab Malik said proper judicial process has been followed and the order is final. "We have to honour the judgement." 7/11 Mumbai train blasts: What role did the convicts play?